Ottawa Valley Tours has always recognized the importance of your right to privacy and we will continue our commitment to safeguarding your personal information. There are ten principles, which form the basis of Ottawa Valley Tours policy. These principles are interrelated and Ottawa Valley Tours shall adhere to them as a whole. As permitted by the Personal Information Protection and Electronic Documents Act, and its regulations, the commentary in Ottawa Valley Tours policy may be tailored to reflect personal information issues specific to Ottawa Valley Tours. Ottawa Valley Tours is responsible for personal information under its control. And has designated its Director – End User Integration as responsible for ensuring the company’s compliance with the following principles. Ottawa Valley Tours shall identify the purposes for which personal information is collected at or before the time the information is collected. Ottawa Valley Tours will limit the collection of personal information to that which is necessary for the identified purposes and will collect this information by fair and lawful means. Ottawa Valley Tours will not use or disclose personal information for purposes other than those for which it was collected, except with the consent of the individual or as required by law. Ottawa Valley Tours will retain personal information only as long as necessary for the fulfillment of those purposes, or as required by law. · A third party for provision of any of Ottawa Valley Tours products or services for which the information was expressly collected. · A third party retained by Ottawa Valley Tours to perform functions on its behalf. Ottawa Valley Tours shall protect personal information by security safeguards appropriate to the sensitivity of the information. 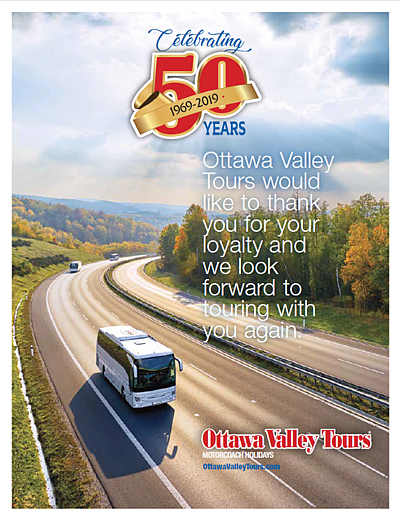 Ottawa Valley Tours will make readily available to customers and employees specific information about its policies and practices relating to the management of personal information. Ottawa Valley Tours Privacy Office shall inform a customer of the existence, use, and disclosure of his or her personal information upon request and shall give the individual access to that information. A customer shall be able to challenge the accuracy and completeness of the information and have it amended as appropriate. An individual shall be able to address a challenge concerning compliance with the above principles to Ottawa Valley Tours designated privacy officer. Additional information regarding the legislation can be obtained through the Privacy Commission of Canada’s website at www.priv.gc.ca or by calling 1-800-282-1376.